I have 3 parts in the Rock City Raptors program. 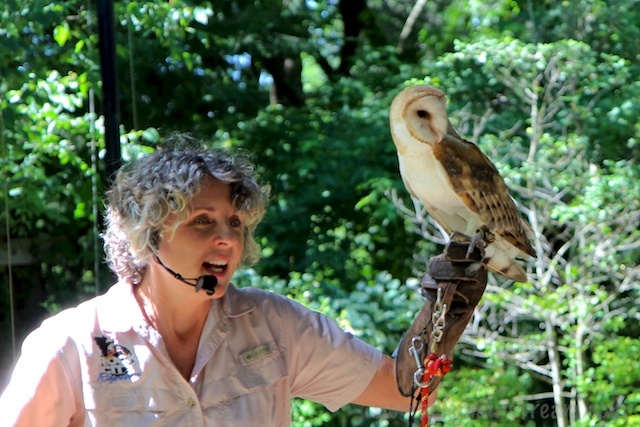 The first is with Screech Owls (see yesterday’s post). My second is with Theo, a Barn Owl. Theo doesn’t always want to sit on the glove. He baits. A lot. When he baits, he spreads his wings and flaps. 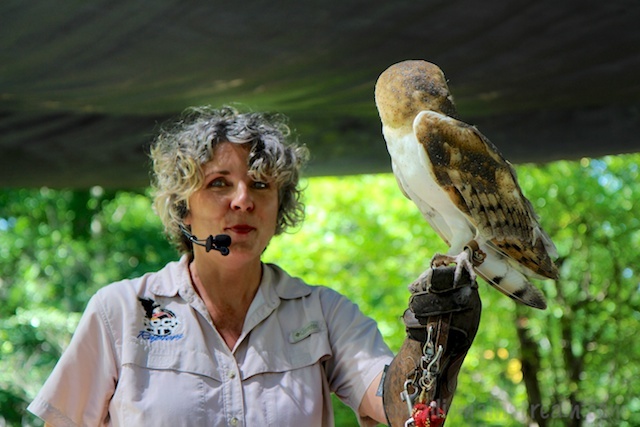 Now, a Barn Owl looks small and innocent when you see him sitting quietly–head to tail they are about the same length as a crow. But when he spreads his wings, which can be over 40” long, he suddenly becomes an enormous bird. This can be rather tricky when you’re making sure you say all the right lines and stepping through a crowd with an owl on your glove. To ease me into the part, at first I just did the talking while Dale walked through the audience with Theo. This past Saturday was my debut at talking and walking with Theo. He baited a few times, but I held him high enough that he couldn’t hit anyone. The only real mishap was when I looked away for a second to find a place to step other than on the feet of an audience member. When I turned back to Theo, it was just in time to see a something that looked suspiciously like a giant wad of wet owl poop falling directly toward the man seated below me. I tried to do a check to make sure he didn’t get hit without missing any lines. I’m not sure if I checked thoroughly enough, but I didn’t see any splatter–with owl poop, there will be splatter. Since Theo is a finicky flier, we decided not to have me fly him this Saturday. I handed him off to Dale so she could fly him with John. 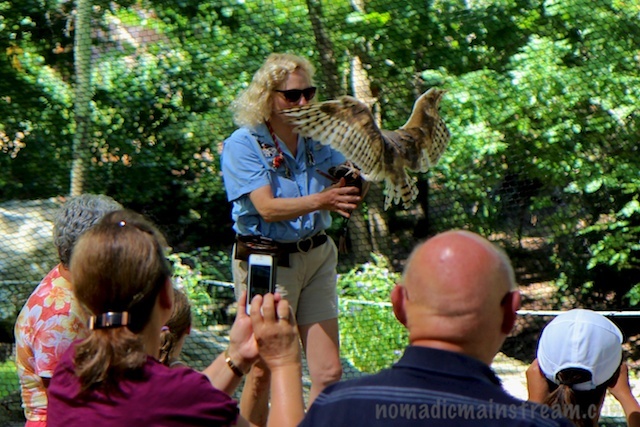 We had done an educational program for a group of students earlier in the week and Theo had baited and baited and baited like he couldn’t wait to fly. He smacked me in the face repeatedly as I tried to adjust my hand to get him in a position where he would settle down. At once point, he got himself upside down and when I reached over with my bare hand to help him up, he accidentally grabbed my arm. I was proud of myself for not panicking–I managed to extract his claws from my flesh with only a few minor scratches and the audience didn’t seem to notice. Then, once it was time to fly, he suddenly sat back and relaxed on the glove like he would be content to sit there all day and nap. So, it seemed like a good plan to hand Theo off to Dale to fly him. He did fly for her at Rock City. He flew like a champ. 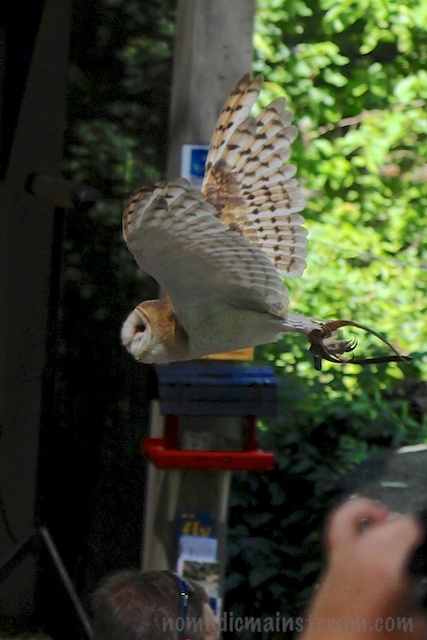 This entry was posted in Birding, Chattanooga, Photography and tagged Barn Owl, Bird photography, Rock City Raptors. Bookmark the permalink.